Chai Chet has a good mix of large mid-range and boutique resorts and a selection of cheaper guesthouses and backpacker places to stay. Accommodation is centred on the terrific beach at the southern end, with four large resorts, Coconut Beach Resort, Koh Chang Paradise Resort, Koh Chang Resort and Flora i Talay all fronting directly onto the sea. Chai Chet Resort sits on the cape overlooking the others. Other bungalows and resorts are found along the main street or around the shopping plazas in the middle of town. Opposite VJ Plaza, Coconut Beach Resort fills both sides of the narrow street which leads down to the beach and via a small inlet on to Chai Chet Resort. Coconut Beach Resort attracts the Russian and eastern European market, boasting a good combination of standard rooms at very reasonable listed rates of 2,500bt a night to larger bungalows down near the sea for 4,000bt. Over on the cape, the large Chai Chet Resort offers well appointed bungalows and villas on the hillside, down by the mangroves or around its swimming pool, with prices at 2,000bt for standard up to to 4,500bt for the deluxe villa. Down on the sand and next door to Coconut Beach, Koh Chang Paradise Resort and Spa is one of the very best Koh Chang resorts, with a range of rooms and large villas, some with pools from 3,500bt upwards all the way to 16,700bt. Look out too for its great deals in the low season. Heading south, Koh Chang Resort, its neighbour, is one of the older Koh Chang resorts and popular with Thai packages, its hillside rooms at 2,000bt in peak, beachside bungalows at 4,000bt. Just a bit further along, you’ll find the boutique bungalows of Flora i Talay, all brushed concrete and thatched roofs, just a few meters from the sea, with its back garden bungalows starting at 3,200bt a night, beachfront bunaglows at 4,200bt, its beachfront villas at 9,100bt and the deluxe pool villas at 15,700bt. Just back for the beach at this end, Pajamas gives Chai Chet a very good backpacker option, individual flashpacker double rooms at 1,700bt or dorm beds from 430bt, with the kidney shaped swimming pool and colourful style all adding to its summery vibe. Towards the southern end, standard or superior bungalows and villas in the garden, by the pool or on the beachfront itself. Restaurant, seafood bbq and spa. Check for frequent good value deals, popular spot. At the southern end of the beach, large boutique resort with stylish a/c bungalows, thatch roofs, sand-stone finish in well spaced rows. Pool villas, restaurant, sun terrace and bar with pool table, 2 small swimming pools. On the cape at the northern end, a selection of hill, garden and seaside bungalows, rooms and villas, with swimming pool, restaurant and mini jungle trek along the coastline. Popular with Thai packages. Backpacker hostel at the southern end of the beach, linked to the sand by decking and the public walkway. A mixture of double rooms with balconey and bathroom or dorm accommodation, either mixed or female only with shared bathroom, all a/c. Great little kidney-shaped pool, breakfast area and Nong Bua Seafood, part of the same group, next door. Perhaps a little over-ambitious with its name, Luxury Guesthouse by VJ Plaza houses a good range of clean and practical rooms over several floors with prices from 1,000bt a night and you can easily walk across the road down to the beach. At the back of the same plaza, VJ Island View is still popular, nothing too fancy but at 450bt a day, it could well satisfy any requirement for long stay accommodation. Habitat Hostel, part of the growing trend for dorm accommodation on the island, occupies the bottom floor of the same building, with dorm beds from 350bt upwards and a wide selection of private doubles, twins and quadruples at 1,200bt to 1,800bt. 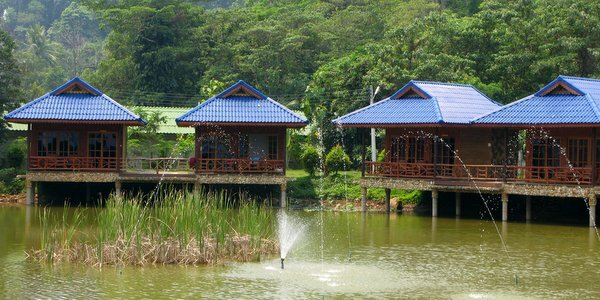 Blue Resort and Spa, across the street on the corner, is also worth a look, with large solid wooden bungalows on stilts around a small lake, prices starting at 1,200bt a night. Off a small soi by VJ Plaza, a 3 storey hotel style building with standard and superior rooms or 1 and 2 bedroom suites. Restaurant and bar, games room, gym and badminton court. Long term deals available. Short walk to the beach. Bottom floor of 4 storey building at the end of VJ Plaza, with male, female and mix dorms alongside communal rooms and shared bathrooms. Private rooms coming soon, restaurants and facilities on the doorstep and just 5 minutes from the beach. Continuing on and opposite the long row of beer bars, Kerdmanee Resort has practical bungalows in rows running up the hill, reasonable rates too for long stay or backpacker starting from 500bt a day. It too has added a swimming pool. Next door, Thai Garden Hill Resort offers rooms in large Lanna style houses around the swimming pool from 1,400bt a night, not a bad choice and only about 10 minutes walk to the beach. You can now also find some more bungalows behind the hardware store at Bann Fine Times, prices from about 1,600bt a night, deals available for long stay. At the northern end, double and twin rooms in Lanna style villas, set in tropical gardens with a swimming pool and restaurant. A good stroll to the beach, but could suit for a few days if the price is right, though the beer bars are opposite. Chai Chet does have other rooms and here is a selection only to go with our recommendations above. At the far northern end, a bit in the middle of nowhere just back from the road, selection of bamboo and thatch bungalows, a/c or fan, bathroom ensuite, in a pretty garden setting. Small swimming pool, restaurant. Long term deals available. At the northern end, standard bungalows, fan and a/c, arranged in twos rows up a steep hill on the mountainside. Monthly rates available. Swimming pool. Long term rents but opposite the beer bars might not suit all. 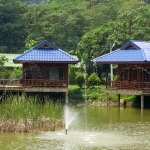 20 natural style wooden a/c bungalows built out on stilts around a lake, with simple spa facilities, restaurant. Out the back, it is just a short hop to the beach at Chai Chet Resort, out the front, the plazas. Three levels of a/c rooms for daily or monthly rent in this motel style building at the end of the plaza, with its restaurants and facilities on the doorstep and just 5 minutes from the beach. Opposite the plazas, standard and superior bungalows, hotel and villa rooms spread out in different buildings along the street down to the beach and on the seafront itself. Swimming pool and restaurant. Very popular with Russian and East European tours. Large older resort towards the southern end, with rooms and bungalows, both sea and hill side, swimming pool, spa and restaurants. Popular with Thai packages.